We’re loving bringing you all the best news, views and tips that we’ve observed at the most fabulous celebrity weddings and this week we’re turning our attention to the venues favoured by the A-list. Whilst we may not be able to afford so much as a G&T at these places, it doesn’t stop us falling in love with them! Read on to find out all about our all-time favourite celebrity wedding venues. Read on to find out all about our all-time favourite celebrity wedding venues. Surely this rates as the most popular celebrity wedding venue ever! Everyone from Millie Mackintosh to Zoe Ball have said ‘I Do’ at this fabulous wedding venue. One of the super sassy Soho House group runs an exclusive private member clubs all over the globe and Babington is their original cool country pad in beautiful Somerset. Surrounded by glorious countryside, the 18-acre site has a principal Georgian house as well as a private chapel, Cowshed spa, indoor and outdoor pool, a lake, tennis courts, croquet lawn and A-list luxe essential – a private cinema. If you’re getting hitched at Babington you’ll have the whole estate to yourself including the 33 glorious guest rooms with their roll top baths, in-room bars and stunning views across the grounds. Beloved by the London set, Babington gives you all the country chic style you’re craving and all just a quick 2-hour zip down the M4. Of course, to really make an entrance you should arrive by helicopter and if you’re thinking of asking the celebrity magazines to cover the day, you’ll be relieved to know they’ve all been here plenty of times before so know their way around! 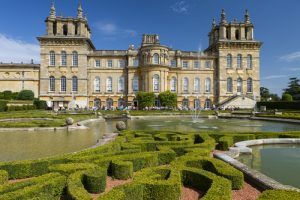 Another celebrity favourite venue for those looking for a blingy, opulent wedding is Blenheim Palace. 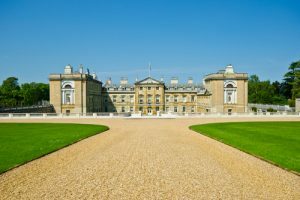 Located in Oxfordshire and currently the home of the 12th Duke of Marlborough, the palace was also the birthplace of Sir Winston Churchill back in 1874. The sheer size and scale of the palace and grounds together with its grand presence make it the perfect option for large wedding celebrations. There are six venues within the estate to choose between and for super scale affairs, the palace can play host to weddings of up to 2000 guests! There are 90 acres of stunning formal and ornamental gardens including water terraces, Italian gardens and a rose garden, so you won’t be short of photo opportunities. Once inside, the grand reception spaces have double height vaulted ceilings, divine chandeliers and vast fireplaces and you can wed in the Orangery which is flooded with natural light, or the jaw-dropping Marlborough room. And, if all that fails to appeal, you’ve got plenty scope for a marquee in the grounds. For a venue with a slightly more quirky appeal, we love the Woburn estate in Bedfordshire. With a 3000-acre deer park, there’s no shortage of outdoor space, not forgetting the safari park next door! There are three venues to choose between for a wedding with the most notable being the Sculpture Gallery overlooking the Camelia lake. Built by Henry Holland in 1789 this is one of the most majestic and tranquil settings we’ve ever seen. For a more traditional backdrop, there’s the luxury Woburn Hotel that offers classic and elegant spaces with views of the Abbey. Or, for a truly quirky option, there’s the Safari Lodge where couples can treat their guests to a trip around the safari park before the ceremony!  Whether it’s an intimate celebration for 50 or a grand and lavish do for 250, this is a beautiful venue that has appealed to both footballers and pop stars alike. To really stand out from the crowd, you can’t go far wrong if you choose London’s largest UNESCO World Heritage site – The Royal Botanic Gardens at Kew. This stunning venue offers a wealth of amazing landscapes, views and architecture as well as an extensive range of formal and ornamental gardens. Escape from everyday life with a unique and private atmosphere that’s probably a huge draw for celebrities selecting a venue where they won’t be plagued by paparazzi. The London location also makes it an obvious choice for all those who can’t bear to tear themselves away from the capital. There are plenty of locations in which to celebrate and take your vows both indoors and out. 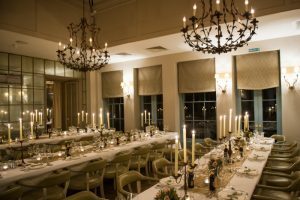 For small affairs, the Cambridge cottage is ideal, though we love the grand scale and decadence of the Orangery for a really memorable event. 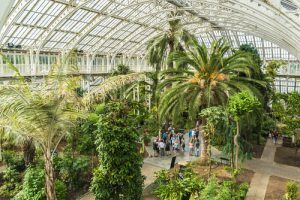 We’re particularly taken by the idea of holding our champagne reception in the stunning Princess of Wales conservatory where the various zones are all climatically controlled to help create a tropical environment for the gorgeous flowers and plants to thrive. And finally, we come to that celebrity favourite… the castle wedding. Which budding pop star didn’t spend their younger years dreaming of a huge white wedding in an actual historic castle? Amberley Castle is the quintessential setting for a fairytale wedding which is evident from the moment you sweep past the portcullis. Reminiscent of years gone by, you half expect to see dashing knights rushing to rescue dainty damsels. 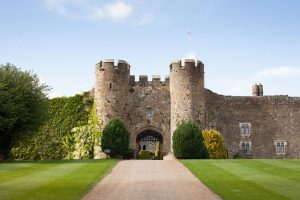 A classic English castle dating back 900 years, Amberley can play host to weddings of up to 56 people within the castle walls, whilst larger celebrations are accommodated in marquees on the lawn. You’ll struggle to find more dramatic photography opportunities than those afforded by medieval stonework, suits of armour and coats of arms. And, we’re pretty certain your guests will feel a certain thrill from mingling amongst peacocks on the lawn. We can see why this venue appeals to those with money to burn and a celebrity magazine deal at the ready. Celebrity Weddings: Dan Baldwin & Holly Willoughby, Dermot & Dee O’Leary. So what did you think? These are our favourite all-time celebrity wedding venues, but which one would you choose? If you’re still searching for your own perfect venue, we’d love to help! Give our lovely wedding planners a call to arrange a private tour of our stunning country Manor House. Call 01394 411288 or email info@woodhallmanor.com to find out all you need to know about Woodhall Manor.